This morning I awoke early to cloudy skies, a light fog on the lake surface, and the chattering of fastidious chipmunks and squirrels preparing their stash for the oncoming winter. I watched a pair of deer – a large mule buck and his doe – meander out of the woods on the far shore, and graze in the shoreline grasses for a few minutes. Then a bit of sunshine peeked through, and they wandered back in, out of sight. As the sunshine became stronger, a light rain began to fall, delivering almost imperceptibly tiny droplets softly onto my tarp and barely dimpling the lake surface. The backlit droplets hitting the lake surface created the illusion of a zillion shimmering diamonds. We hiked about five and a half hours today, down Fish Creek to its confluence with the West Fork of Rock Creek and down its spectacular gorge, and then along the main fork Rock Creek and Upper Stillwater Reservoir to our trailhead. At the truck I ate my final “trail snack” – a packet of cream cheese mixed with a packet of smoked salmon and rolled up in a tortilla. 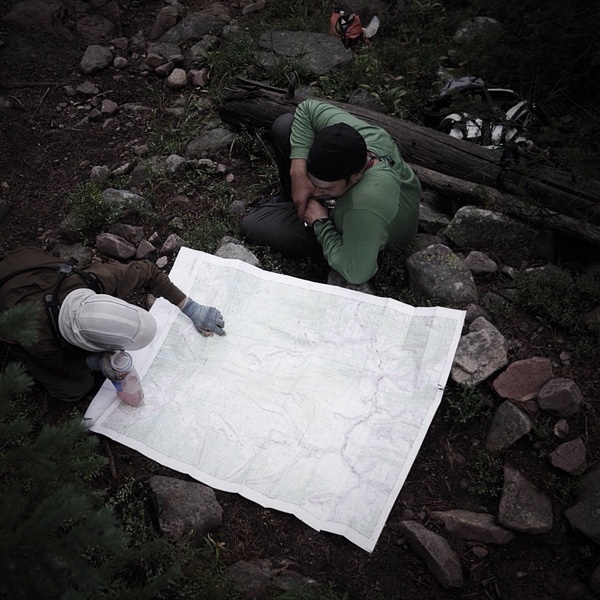 Photo: Reviewing our route circumnavigating the Rock Creek Basin in the High Uinta Wilderness.